304 SS Round Railing, Size(millimetre): 2" 3" 5/8"1 1/2"
Catering to the requirements of our clients, we are involved in offering Ornamental Railing. 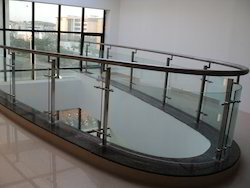 Being a quality oriented organization, we are involved in providing a supreme quality range of Outdoor Metal Stair Railing. We are the leading organization in the market to offer the best quality range of Pipe Union.